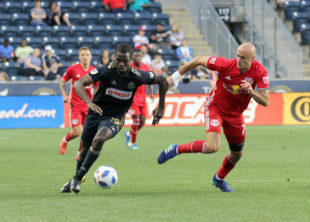 Aurelien Collin signed with the Union. Any bets on how soon he’s red-carded? Let’s start the bidding at April 30th. Ernst Tanner might not allow Mark McKenzie to play in the the U-20 World Cup. Both Matt DeGeorge and Jonathan Tannenwald reported on it. The Union released their preseason roster with key holes to fill. Remember midfielder Michael Lahoud? He’s now with San Antonio FC. The Philly Sports Network wonders what Ernst Tanner’s system will look like. Staffing changes over at Reading United. The US Youth Soccer National League Girls teams that competed this past weekend wrapped up their second event of the season on Monday in Florida. SJEB Rush 02 Academy Blue, out of Sicklerville, NJ, were 17U Red Champions. The Philadelphia Sports Writers Association honored Rowan University goalkeeper Shelby Money on Monday. The Middle Atlantic Conference (MAC) announced its 2018 Academic All-MAC teams for men’s and women’s. The upcoming season will be Tim Howard‘s last. Diego Fagundez wants out of New England. Some guy on a golf course has something to say about it. Montreal Impact owner Joey Saputo is stepping down as the team’s president, handing duties over to a former Montreal Canadiens executive. Wayne Rooney spoke “broken English” when arrested in December. A billionaire signed on with Sacramento Republic FC, which could help with its MLS bid. Gregg Berhalter built the Columbus Crew around a superstar No. 10. The USMNT doesn’t have one. How does he solve the Higuain problem? Bill Hamid thought he was better than the other goalkeepers in the January camp. Apparently not. The USWNT ended Spain’s 15-game unbeaten streak by beating them 1-0 thanks to a goal from super-sub Christen Press. Sing it, Warm Wires! In other friendlies news, Canada also notched a 1-0 win, over Norway. Captain Christine Sinclair’s goal was her 178th international one — she’s six shy of the record. Defender Julia Ashley, who was drafted by Sky Blue, has opted instead to play for Linköpings FC in Sweden’s first flight. Cardiff City striker Sala feared dead after suspected plane crash. Tottenham just can’t catch a break. Now midfielder Dele Alli is out injured until March, like his teammate Harry Kane. FIFA president Gianni Infantino wants to add two tournaments to the global soccer calendar, but European officials aren’t having it. Usain Bolt says he’s done with soccer. How have three Dortmund reserves coaches ended up in England? Believe it or not, if you ask him (or just watch him play and raise his hands in disbelief), Collin has never committed a foul in his career. Reminds me of Bill Laimbeer. 1979-1993 in the NBA, and never committed a foul. Perpetual whining, and somehow everybody around him wound up injured, but never a foul. So Sacramento is now number 28. Saint Louis leads for 29, Phoenix number 30, with the last two spots left to candidates from Detroit, Tampa Bay, Las Vegas, San Antonia, Carolina’s, Louisville…. They’ll have to split the league and not play “inter conference” to keep the schedule balanced. 16 teams in each division playing everyone else home and away is 30 matches, only 4 less than current 34 match schedule. Would leave plenty of time for playoffs. That or just rotating four teams a year. I don’t see the playoff field expanding as they want to have the season done before the international break. Would be nice if they could make up for games with expansion of teams by creating a tighter U.S. Open Cup schedule. To me the drama of the tournament is lost when you have weeks and months between rounds. Is now when I pop up and mention something about pro/rel? Split the league into two 16 team divisions MLS “A” and MLS “B”. Not sure what you want to call it, but take some of the bottom A teams and better B teams and have them play at end of each season to rejoin MLS “A”. Agreed on this happening. I see this expanding to 32 teams with 4 divisions of 8 teams each. Each team plays the teams within their division twice per season then one match outside of the division against the other 21 teams. That sets the schedule to 35 games per season. I don’t see pro/rel in the cards for some time given the money these owners/investors are having to pay to buy into the league. Wouldn’t there be 24 other teams to play against for a 38 game schedule in your scenario? Not sure how 38 games would fit with Open Cup and CCL. Correction it would set the schedule at 38 matches with 24 out of division matches. Where’s the auto-correct when one needs it? That would mirror the count of premier league matches. Not sure how to squeeze in CCL and US Open Cup Matches without increasing the season. My thoughts on pro/rel going forward is not to engage anymore. There are no signs that it’s an option on the table with MLS or USSF present day. However expansion is on the table so that’s where my focus is at right now. Hypothetical arguments have been exhausted as far as I’m concerned and until that changes from the two organisations above, I really don’t see the point and that’s the truth. Apparently we were typing at the same time, like I posted above, some sort of MLS A and MLS B could give a “pro/rel lite” option to sort of satisfy everyone. then how do you respond to USL, the second division in US Soccer actively pursuing an opened tiered system across three divisions? are you going to chose not to engage with others about realities of significant conversation and planning within US Soccer beyond the hypothetical despite your assertion they are not actual realities? It certainly wouldn’t be open, unless MLS is willing to refund franchise fees on the way out the door. Hey Scott. I was referring to John’s post. …Jopatown FC has an opportunity to play its way into said divisions. Its like eating the chocolate candies you get at Easter that are cheap and bleh. Its chocolate, yes, but not real chocolate.